Brijmohan Lall Munjal, the founder and chairman emeritus of Hero MotoCorp Ltd, passed away on Sunday after a brief illness. He was 92. A first-generation entrepreneur who worked at an army ordnance factory at Kamalia in what is now Pakistan, Munjal moved to India with his family in 1943 and created a multi-billion dollar two-wheeler empire. He is survived by three sons and a daughter. Munjal retired from an active role and became chairman emeritus of the $4-billion Hero Group earlier this year, though he remained on the board of the company as a non-executive member. His son Pawan Kant was elevated to the position of chairman at the time. Born in 1923 at Kamalia, Munjal started a small business of making bicycle components in Ludhiana in 1944 along with his brothers Om Prakash, Dayanand and Satyanand. The Hero Group came into existence in 1956. 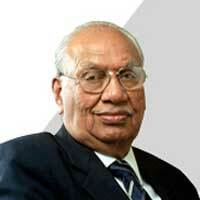 Om Prakash Munjal, who later founded Hero Cycles, passed away in August this year at the age of 86. Hero Cycles is India's largest bicycle maker. In 1984, Hero Group formed a joint venture with Japan's Honda Motor to make motorcycles. The joint venture, named Hero Honda Motors Ltd, became the world's largest motorcycle maker. It was renamed Hero Motocorp after the two partners split in 2010. Munjal was conferred with the Padma Bhushan, the nation's third-highest civilian honour, in 2005 for his contribution to trade and industry. He has also helped establish numerous medical, educational and infrastructure facilities. Munjal had held leadership positions in many industry groups such as the Society of Indian Automobile Manufacturers and the Confederation of Indian Industry. He had also served as a member of the regional board of the Reserve Bank of India.